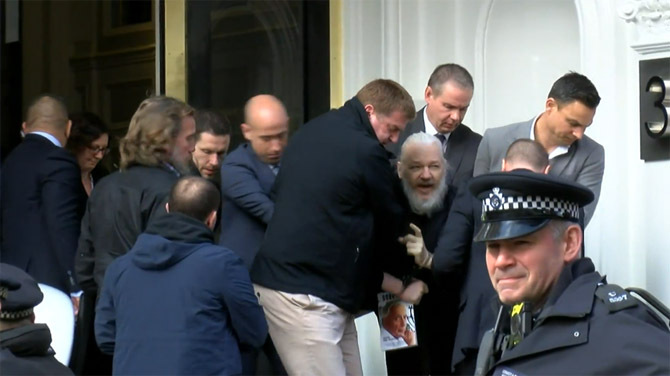 The only thing standing between an Assange prosecution and a major threat to global media freedom is Britain The US government’s indictment of Julian Assange is about far more than a charge of conspiring to hack a Pentagon computer. Many of the acts detailed in the indictment are standard journalistic practices in the digital age. How authorities in the UK respond to the US extradition request will determine how serious a threat this prosecution poses to global media freedom. Journalistic scrutiny is a key democratic safeguard against governmental misconduct. Strong reporting often depends on officials leaking information of public importance. That is why, although many democratic governments prohibit officials themselves from disclosing secret information, few prosecute journalists for publishing leaked information that they receive from officials. Similarly, because electronic communications are so easily traced, today’s investigative journalists often make extraordinary efforts to maintain the confidentiality of their sources, including setting up communication avenues that cannot easily be detected or intercepted. The Assange prosecution threatens these basic elements of modern journalism and democratic accountability. Superficially, the single charge in the indictment concerns an alleged conspiracy between Assange and Chelsea Manning, at the time a US army intelligence analyst, to download Pentagon files for publication on WikiLeaks. Assange is accused of trying – ultimately unsuccessfully – to help Manning crack a password that would have enabled her to bypass security mechanisms that would identify her as the person downloading the files. But beyond this alleged hacking attempt, the indictment details “manners and means of the conspiracy” that read like standard procedure for today’s journalists who receive information from a confidential source. It alleges that “Assange and Manning took measures to conceal Manning as the source of the disclosure of classified records to WikiLeaks, including by removing user names from the disclosed information and deleting chat logs between Assange and Manning.” It says they “used a special folder on a cloud drop box” for the leaked information. And it charges that “Assange encouraged Manning” to provide the information. It is dangerous to suggest that these actions are somehow criminal rather than steps routinely taken by investigative journalists who communicate with confidential sources to receive classified information of public importance. It is not difficult to imagine how autocratic governments, eager to undermine media scrutiny, will use this indictment to punish such journalists. The Trump administration also poses a threat. So far, the administration has not charged Assange for the disclosure of the information he received from Manning, but that remains a possibility. The administration filed the hacking charges against Assange a year ago, just days before the eight-year statute of limitations was about to expire for the alleged acts in 2010, but the 10-year statute of limitations has not yet run for the Espionage Act, which has been mooted as a way to prosecute Assange despite the severe implications for journalism of applying it to a public vehicle such as WikiLeaks. The indictment lists violation of the Espionage Act as one of the purposes of the alleged hacking conspiracy. Manning already served nearly seven years of a prison term for leaking Pentagon files to Assange, until Barack Obama pardoned her. But Manning is now back in prison as part of the Trump administration’s effort to coerce her to testify before a grand jury. Because it is unlawful for the US government to use a grand jury simply to prepare for trial, the Trump administration may well be contemplating additional charges against Assange. British authorities have the power to prevent any US prosecution from eroding media freedom. The extradition treaty between Britain and the United States requires extradition only if “the conduct on which the offense is based” is punishable in both countries. And the treaty prevents the US government from filing additional charges after extradition unless they are based on the same set of facts or the British government consents. These provisions empower British authorities to insist that the hacking charges are not a subterfuge for – or a first step in a frontal attack on – legitimate journalistic activity. In other words, Britain can refuse to extradite Assange unless the Trump administration gives a binding guarantee that the prosecution, now and in the future, would not extend beyond the narrow charge of conspiring to hack a government computer. On 22 April, the Guardian is hosting an event with Greta Thunberg and Anna Taylor, from the UK Student Climate Network, with an introduction from Caroline Lucas MP, and chaired by the Guardian’s Zoe Williams. Renewable energy could supply two-thirds of global final energy consumption if transport, heating and cooling is electrified, global body says. The post Renewables will dominate world’s energy needs, says global body appeared first on RenewEconomy. Developers of large scale solar farms under construction warn that new rules in Queensland will blow out costs, cause delays and result in job losses. The post Large scale solar developers warns of cost blowouts, job losses appeared first on RenewEconomy. What killed the Port Augusta solar tower project? Was it the new transmission link to NSW? Or was it problems with its own technology? The post Port Augusta solar tower: Did new inter-connector claim its first victim? appeared first on RenewEconomy.